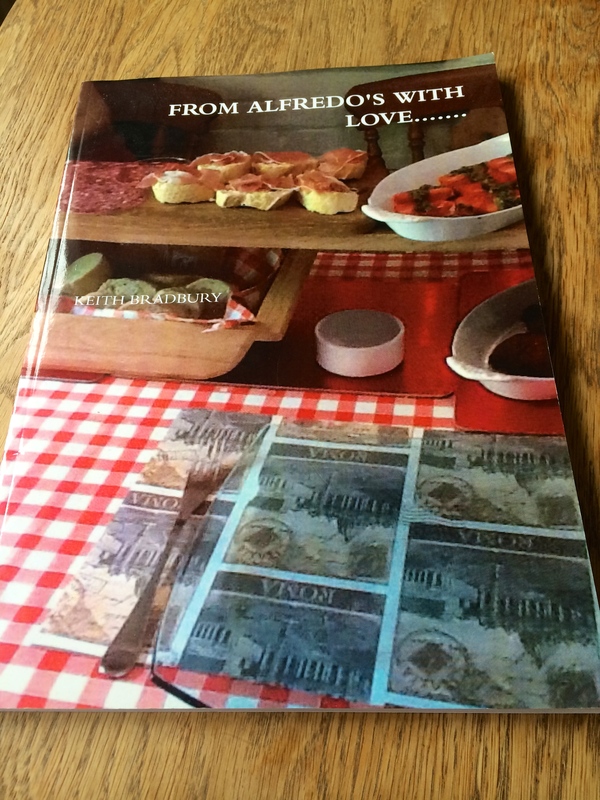 This recipe is already on here (16th March 2015) please check it out. 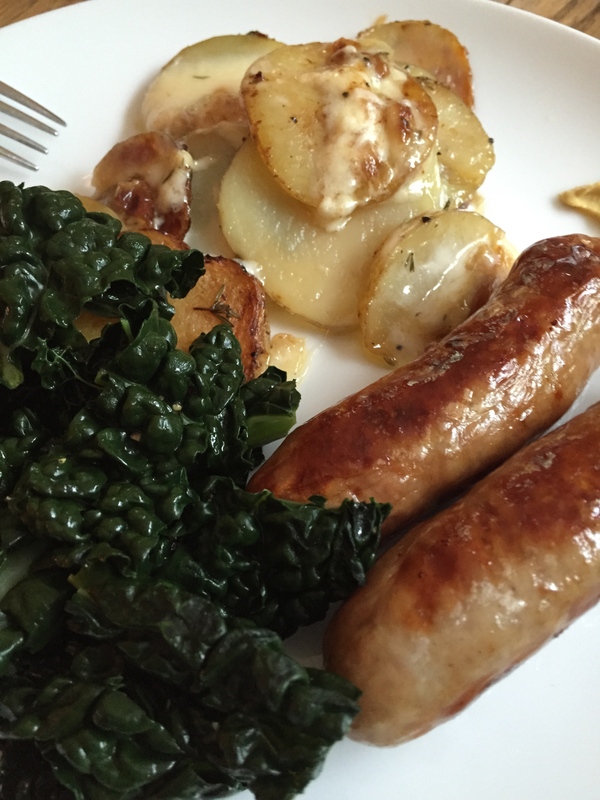 I had it tonight with oven baked sausages which I coated for the last five minutes in balsamic vinegar. Also on the plate was some lightly steamed cavolo nero, finished in butter, black pepper and sea salt. 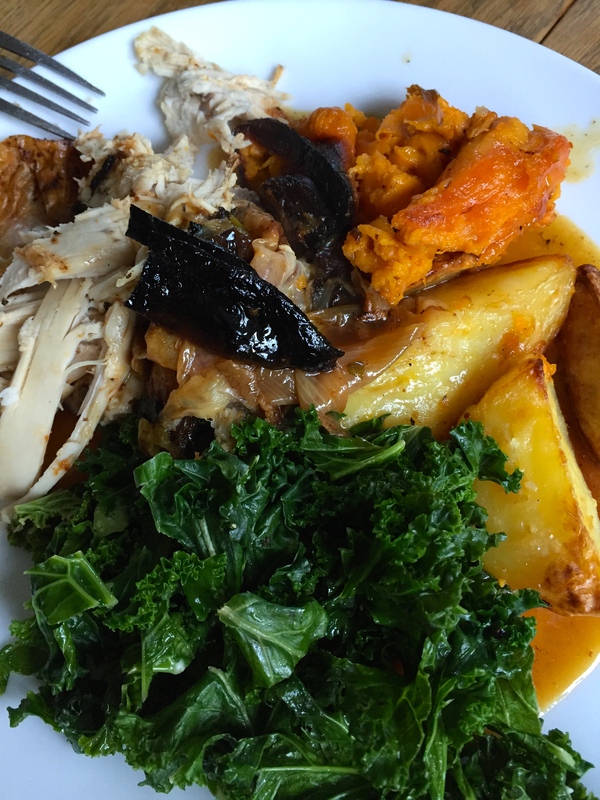 Kale is such a favourite green of mine….makes me feel good every time I eat it. 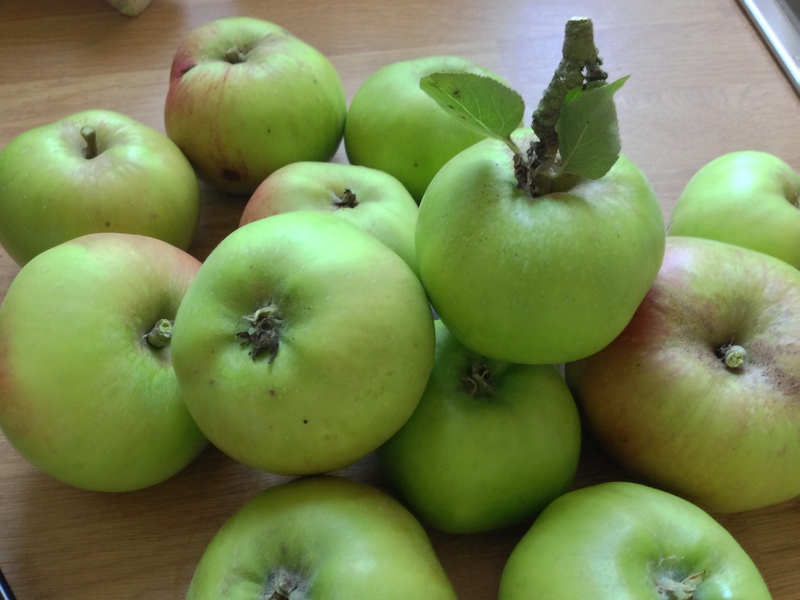 It has a wonderfully deep green earthy flavour and a real crunch to it. And it just looks so beautiful too! Anyway, the other night I had several leaves left over and loitering in the fridge with little to do from a previous meal so I fancied a pasta dish and i fancied kale – a marriage made in heaven! I pan fried a clove of garlic chopped finely in olive oil with three strips of good smoked streaky bacon chopped into small pieces. You could use lardon also or pancetta. When it was cooked, I turned the heat down, sliced the kale leaves into small strips and added them to the pan, stirring them round over a medium heat to let them wilt a little – just a minute or so. I had already cooked my pasta. I drained it and left to one side whilst I stirred 150 ml of single cream into the bacon and kale mixture, added a grind or two of black pepper and turned the heat down low whilst I stirred all the ingredients together. 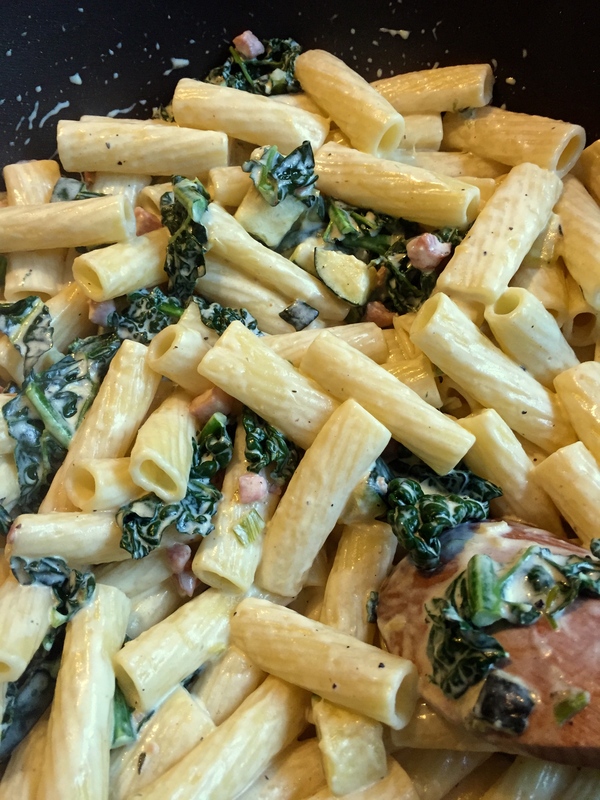 I then tipped the drained pasta into the pan and stirred it all round to coat each piece – I used rigatoni. You could add a little dried chilli to it with the kale if you fancied a little zing. It really is a fab way to eat your greens, I have to say! Not only is this dish simple to assemble, it ticks every box for a sour, dull, dank, rainy day in need of serious cheering up on the food front! I made it yesterday for a late lunch. Cooked for 4 of us and there is still a bowl left over for a late night something later on! Add a good glug of oil to a large frying pan and when hot add the beef. Stir round til browned all over. Remove and place in a large casserole dish – one with a lid. Add the onions to the frying pan and fry until the onions soften. Add them to the beef and then add the flour. Put over a low heat whilst you stir in the flour. Add the thyme, bay leaves, garlic and a swizzle of salt and a good grind of black pepper. Add the stock and beer, stir and add the tomato puree – you can use a good brand tomato sauce instead if you wish. Once it is starting to simmer – put the lid on and pop in the preheated oven for 2 hours and ten minutes. 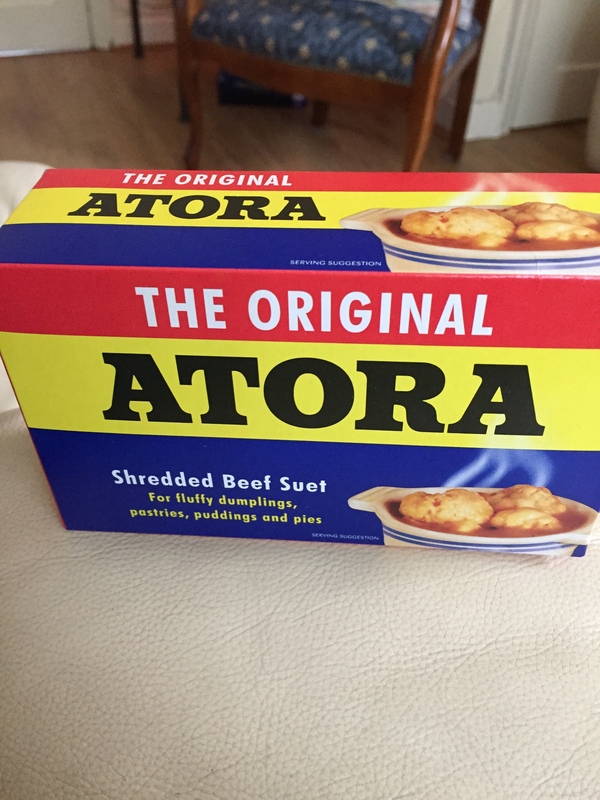 You will need 100 gm of self-raising flour and 50 gm of suet – I use Atora – love the funky 60s retro box! Mix the flour and suet together in a bowl, add a good pinch of salt and then around 5 table spoons of cold water. Mix it together until you get a good consistency and no flour is left in the bowl. Wash your hands and then make 8 golf ball size dumplings. Put to one side. 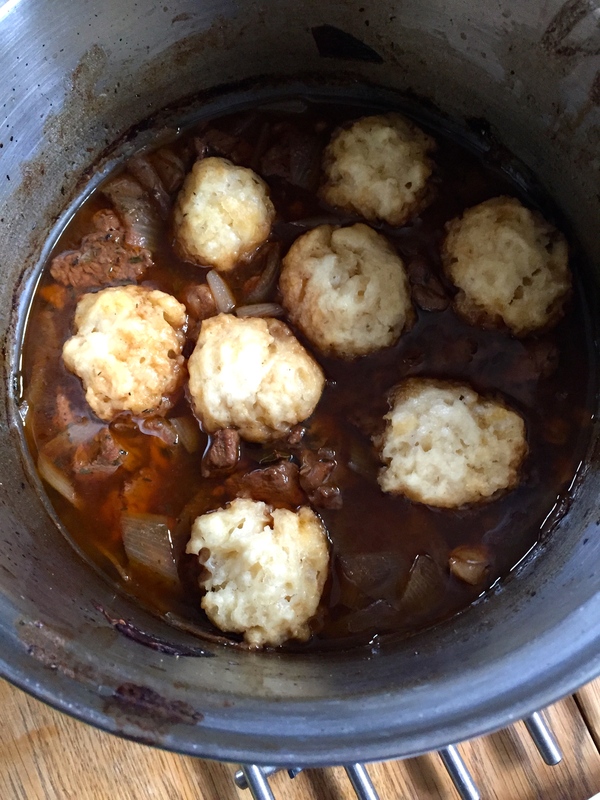 When the timer goes for the beef, remove the lid and gently place in the dumplings – well spaced out – pop lid back on and return to the oven for twenty minutes. I served the casserole with sweet mashed potato, buttered with a little cumin. I also had steamed kale and new potatoes in butter and coriander. It was a marvellous combination of flavours. As with so many recipes this is one you can tinker with to your heart’s desire – you could use half beer half stock – even all beer if you wished! You could add a little pureed spinach to your dumpling mix – the possibilities are endless. This is funky – admit it ! “Did you ever eat Colcannon, made from lovely pickled cream? And the more I think about it sure the nearer I’m to cry. 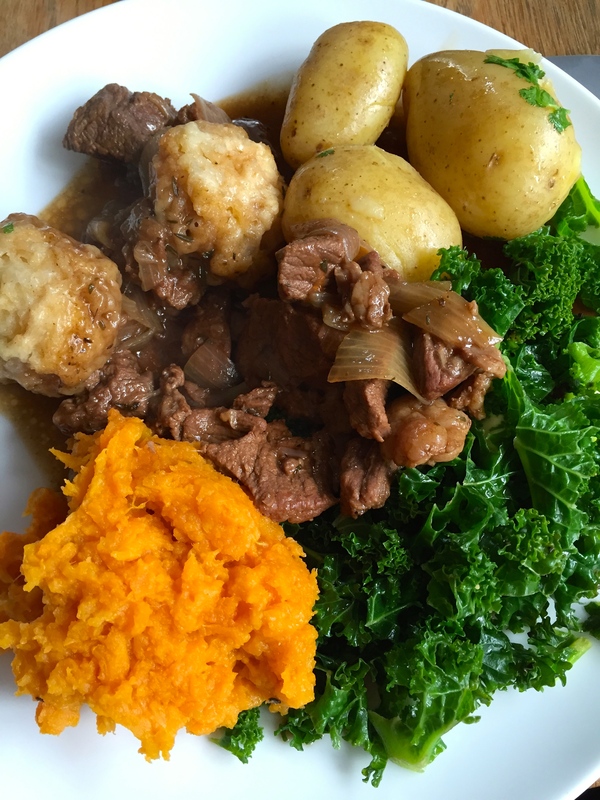 So goes the traditional Irish song about this wonderful potato dish – there cannot be many food stuffs that have their own song ! – and I guess there are many takes on this classic potato and cabbage dish. Its Irish name is cál ceannann, meaning “white-headed cabbage”, and it is a traditional dish mainly consisting of mashed potatoes with kale or cabbage. It is similar to the Irish dish Champ which is a dish of mashed potatoes, moistened with milk and butter and flavoured with chopped onions or scallions or even nettle tops (much underused veg! See my Nettle Frittata). Apparently, colcannon was used on All Hallow’s Eve for marriage divination. Charms hidden in the bowls of colcannon were portents of a marriage proposal should a lucky unmarried girl find one. One other marvellously bizarre tradition was for a young girl to stuff a sock with colcannon and hang it on the handle of their front door. They believed that the first man through the door would become their husband. Could have led to some interesting situations and possible intermarriages….also must have ruined the socks! The dish came over to English shores in the 18th century and oddly became a favourite of the upper classes. In time the English version morphed into bubble and squeak, which is more of a fry up of left overs rather than this purpose built spud dish. 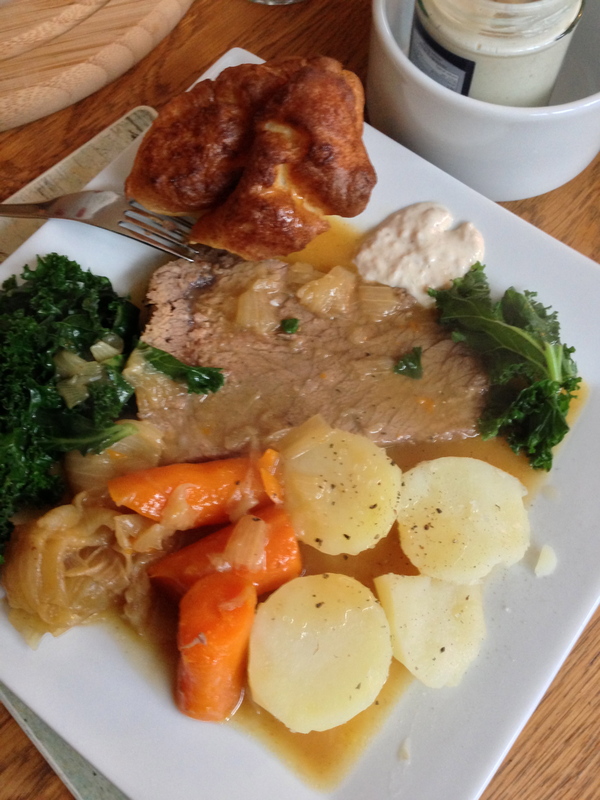 It is a very hearty and warming dish and you can twiddle with it to your hearts content – but this is a version I particularly like – I had it the other night with a honey and mustard glazed hock of ham and it brought out the Irish in me! (My great grandparents were form Derry). I am sure you must have tried this or something like it but if not, give it a whirl. It is a delicious way to eat potatoes and greens. And versatile… and it can accompany all sorts – and ’tis just as gorgeous on its lonesome! Heat the oil in a frying pan over a medium heat. Add the onion and fry for 8-10 minutes, or until softened and golden-brown. In a large bowl, mix together the mashed potato, butter, cream, blanched cabbage and mustard until well combined and season, to taste, with salt and black pepper. As I said before I used it to accompany a hock of ham- and i also made a taleggio cheese sauce which really, really went well with the ham and colcannon. I just popped 450 ml of double cream and a clove of garlic into a small pan with a bay leaf. I brought it to a simmer then added a 100 gm slice of taleggio and let it melt. A stunning sauce to go with a stunning and simple potato dish! 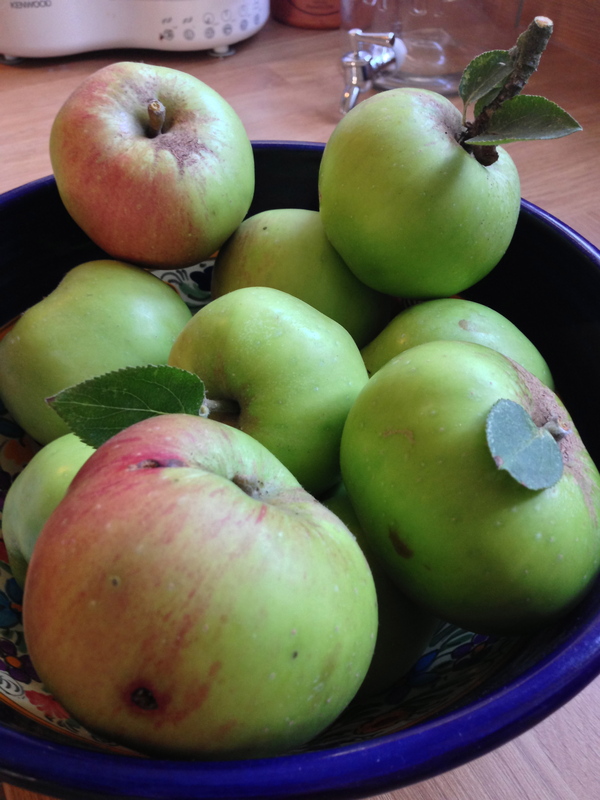 Late Summer Saturday Supper…enhanced by early Autumn apples! apples as I collected a whole basketful of them on an afternoon wander around the grounds. Obviously it had to be an apple sauce as I had some gorgeously perfect pork chops quietly ruminating in my fridge. I made the sauce first – 500 gm of apples peeled and cored, 20 gm castor sugar and 100 ml of water – all into a pan with a lid on a low heat until all had blended into a tangy toothsome concoction. I pan fried pork chops til golden with garlic cloves and black pepper. I also wanted something cooling, so plumped for a simple warm potato and red onion salad – using garlic mayonnaise. I steamed some broccoli and kale, taking it off in time to leave the broc with a bit of a bite. I have to say that it was a very satisfying supper – simple – cheap and bursting with flavours and textures – the apple sauce helped it all on its way – as did a very nice bottle of tempranillo thank you very much that had insinuated its way into my presence whilst cooking. I am easily tempted!